Rhinoceroses just make me smile. They look like a cross between a horse, a unicorn, and a Hippopotamus. I thought that I would share some fun facts about them. They are the second largest land mammal on earth and are related to zebras and horses. They eat veggies only and weigh upwards of 8000 pounds. This is my main reason for not becoming a vegetarian! Oxpeckers are the birds that you frequently see on the backs of Rhinos. Not only do they eat ticks, they hiss loudly when there is danger nearby, providing a secondary warning system. A group of Rhinoceroses is call a “Crash.” This is also what happens if they run into you. What makes me love them the most is their wrinkles. When I saw this stamp set I just had to add wrinkly folds of skin! These are African Rhinoceroses, so I have them roaming the Savanna. 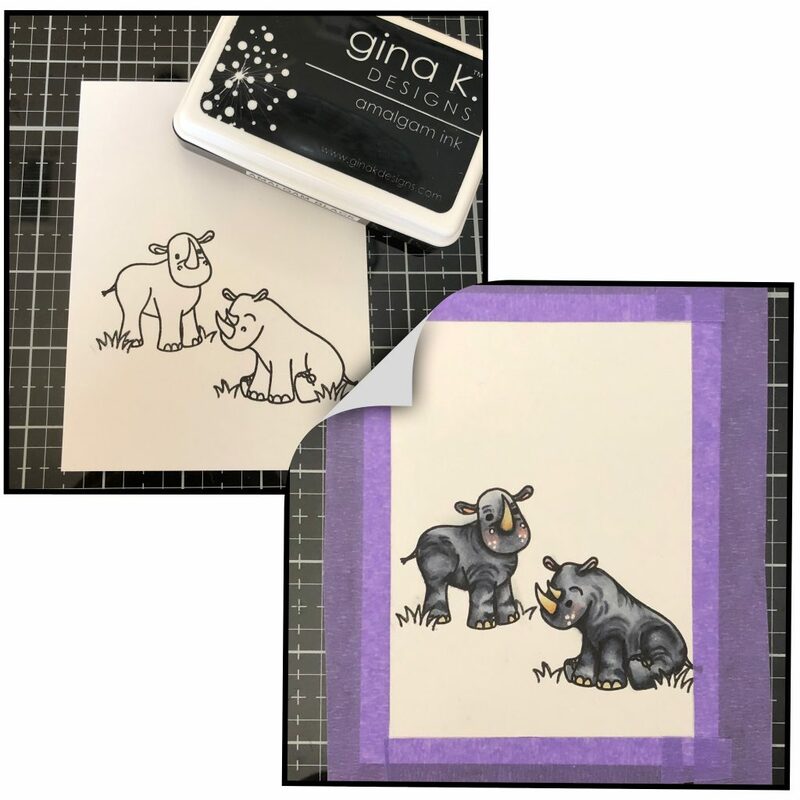 I started by stamping the Rhinos, from the Rhino Bird Day Stamp Set, with Copic friendly Gina K Black Amalgam Ink, onto #80 Neenah Solar Crest cardstock. I have included the Copic colors for those who like to know. I darkened the eyes with a Black Gelly Roll Pen and added freckles with a White Gelly Roll Pen. Next, I masked off the outside edges 1/4” in with low tack Purple Tape. I put down a stencil mask for the hills using the Honey Bee Winter Wonder Background Stencil. Over that I started adding clouds with a Honey Bee Outdoor Scene Builder Stencil, Tumbled Glass Distress Ink, and a mini blending tool. I laid on the top part of the hill stencil mask and added Antique Linen, with a little Vintage Photo near the top of the hills and a touch of Bundled Sage near the bottom. I didn’t bother to mask the Rhinos. I was careful around them and they are so dark that it didn’t seem to matter. I added a piece of purple tape across the bottom of the hills and added Shabby Shutters, Bundled Sage, Peeled Paint, and touches of Vintage Photo Distress Inks for the ground. 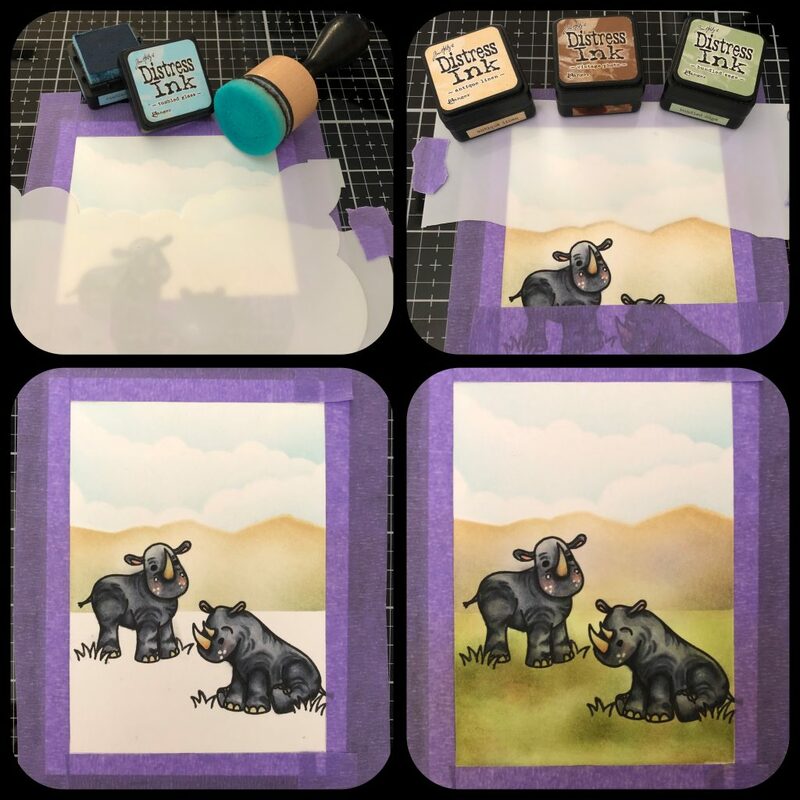 I went lightly around all the edges with Vintage Photo Distress Ink to give it a vintage look. I removed the tape and traced around the edge with a 0.2 Copic Multiliner. I also traced back over all the image lines to reinforce them. 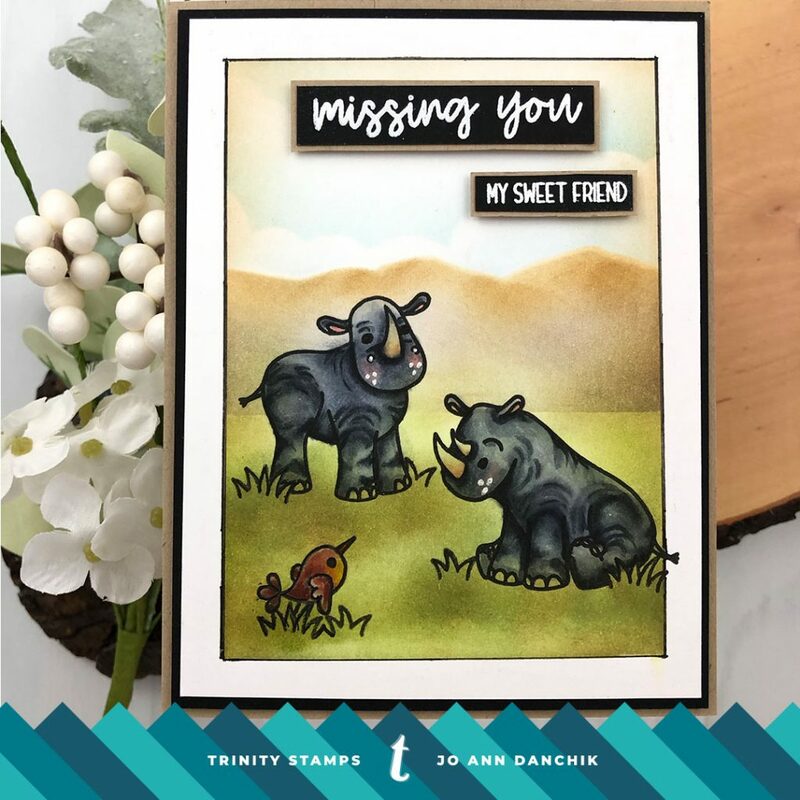 The sentiment is from the Hello Sweet Friend Stamp Set. It was stamped with Versamark on black cardstock and heat embossed with Hero Arts White Detail embossing powder. Don’t forget to use an Anti Static Powder tool first. 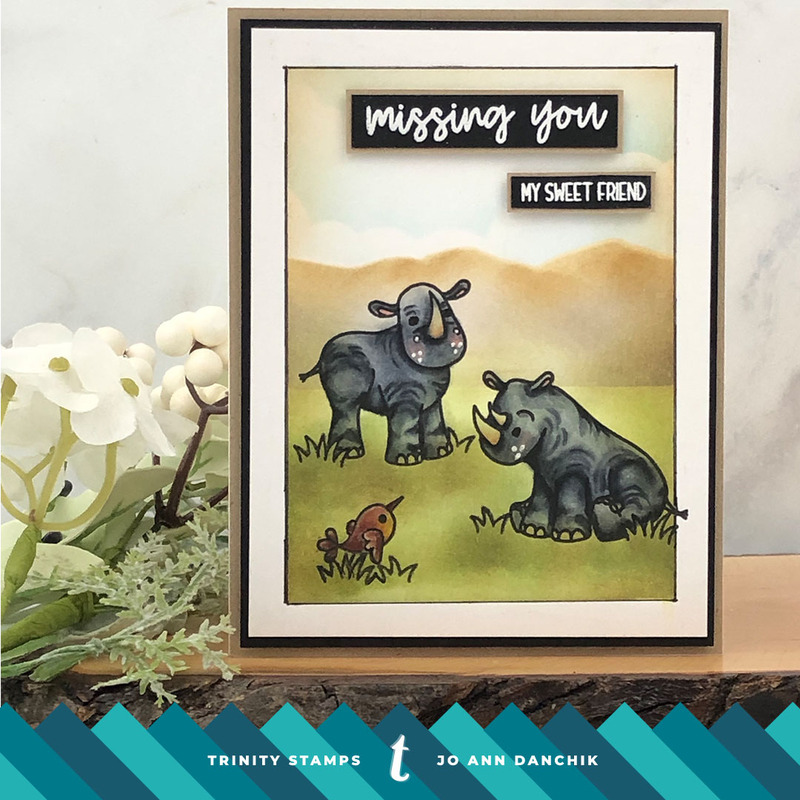 The sentiment strips were layered onto pieces of Desert Storm Khaki cardstock. Scotch Foam Tape was added to the back of the panel and to the back of the word strips for added dimension. If you leave this off you will have a one layer card. 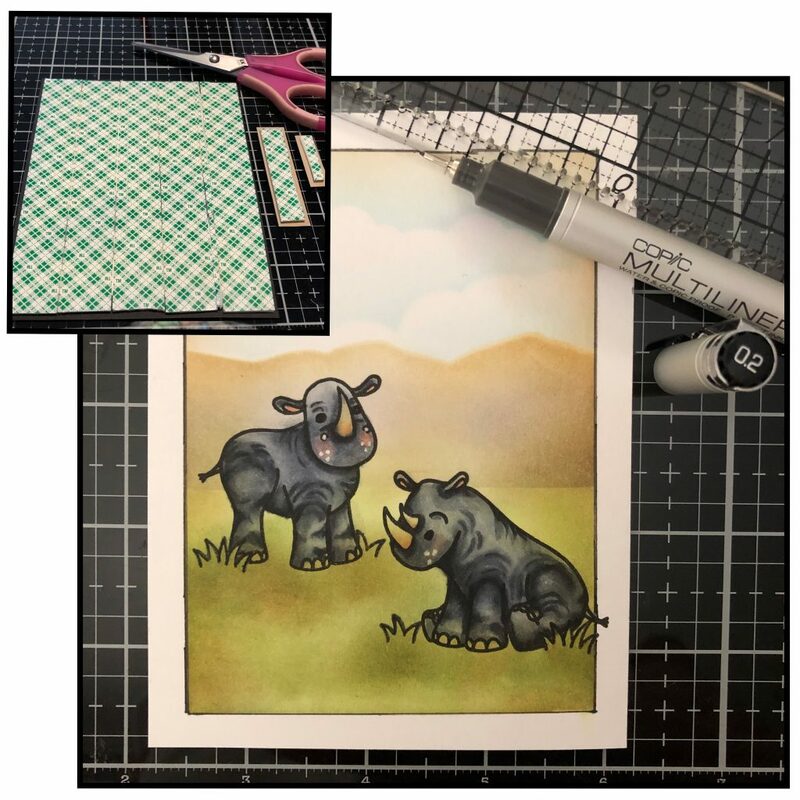 After layering the panel onto a piece of Khaki cardstock, and then onto a #110 Neenah Solar Crest Cardstock card base, it just felt like something was missing. I put the whole thing into my stamping tool and stamped one of the Oxpecker birds and some tufts of grass. I love how the rhino is looking down at it’s bird friend. I was able to color over the Distress Ink with Copic Markers. Because I did not want to make a mistake at this point, and have to start over, I laid a piece of acetate on top of my work to stamp on. It allows you to see if you like what you are adding, and to get perfect placement. Once I was happy with the outcome, I removed the acetate and stamped the bird and grass. Seriously…how can you look at these sweet wrinkly rhinos and not smile? As always, thanks for joining me today. I look forward to creating with you again here at Trinity! You can also find me on Instagram atjadanchik or on my blog at jadanchik.comfor more product detail. I love this whimsical card. It puts a smile on my face. Thanks for sharing your talent with us today. Love the fun facts! Also why I an not,a vegitarian. 😉 Such a cute card, makes me smile! Love Rhino facts and that explains. Why I am also not a vegitarian! 😉 Such a fun creation! Ha! I love this card and all the fun facts! !